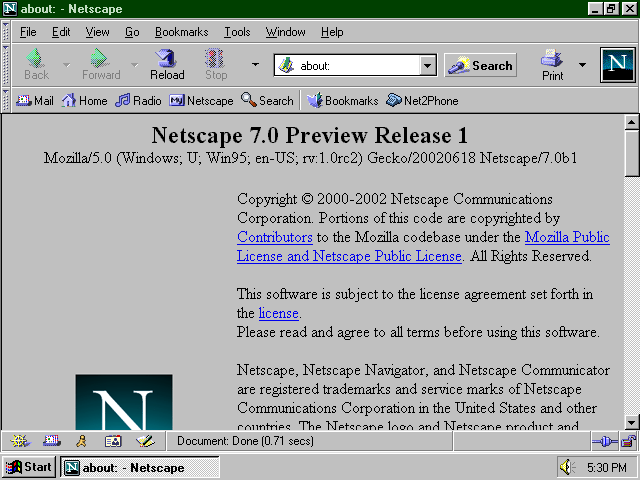 After several 6.x releases ranging from negative to lukewarm in their reception, Netscape began to up the ante by unveiling a preview release for Netscape 7.0 (derived from a release candidate for Mozilla 1.0) in May 2002. 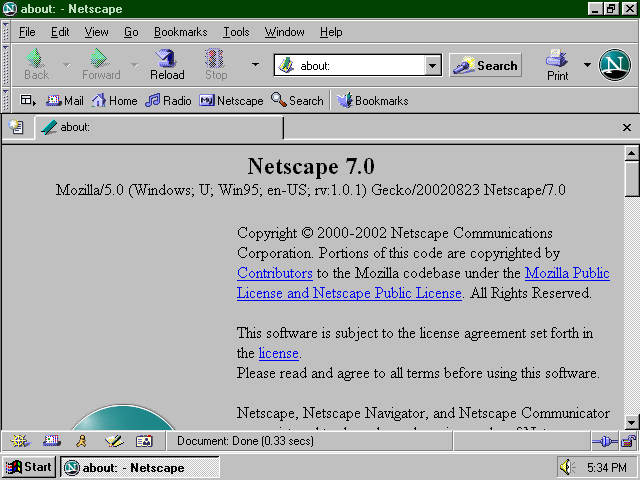 Although similar to Netscape 6.x in many ways, Netscape 7.0 PR1 contained a large number of additional features and other improvements that had primarily surfaced in Mozilla 0.9.x within the last year: Tabbed browsing, site-icon support, a download manager, full-screen mode, a print preview tool, a built-in update notification feature replacing the previous SmartUpdate tool, and the onetime-entertaining diversion of Netscape Radio to name a few. A "Mail" button was added to the Personal Toolbar while "Shop" was removed and the "Net2Phone" link gained a custom icon. Stability continued to improve to a level better than ever before, despite ostensibly being a beta software release. On June 5, 2002, the long-awaited 1.0 version of Mozilla was finally released. The menu bar had been shuffled around from version 0.9.9, with the "Search," "Tasks," "Debug," and "QA" menus removed and "Tools" and "Window" menus added in their place. Otherwise there were few noticeable changes, with the last feature development having instead taken place with the 0.9.x releases. This software release also marked a change in the way the software was developed and maintained, with 1.0.x serving as a "stable" development branch (largely to maintain Netscape 7.0x, which used Mozilla 1.0.x as a basis). 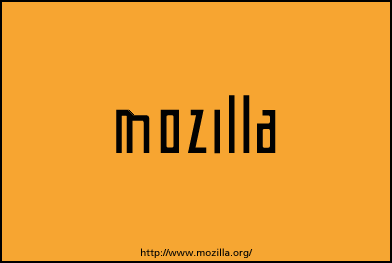 Mozilla 1.0.1 and 1.0.2 bug-fix updates were released concurrently at the time when Mozilla 1.1 and later versions were implementing more daring changes. Just as notably, the final release of Netscape 7.0 was released two months after; derived from Mozilla 1.0.1 and boasting a set of further refinements. Perhaps most noticeably, a new round Netscape logo (shown in icon form at right) was adopted, replacing the square version introduced back in early 1995. The innovative tabbed-browsing feature was emphasized in comparison to the preview release, with the tab bar made visible by default and a close-tab button added. A handy sidebar toggle button was also added, and the Composer and Address Book buttons on the component bar switched positions. 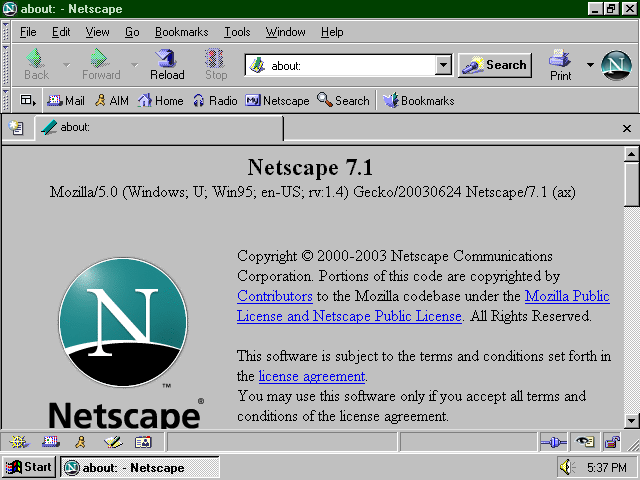 Curiously, Netscape began to omit Windows 95 from its system requirements list with this software release even though it ran perfectly on that OS (as witnessed here), and the pop-up blocker feature implemented in Mozilla earlier was not added to Netscape until version 7.01. But what would you expect from a company subjugated under AOL control? The first subsequent Mozilla version, released only two months after version 1.0, was 1.1. Developments included improved rendering capabilities, the download manager being enabled by default, a "Create New Tab" button on the tab bar (also present in Netscape 7.0 and presumably Mozilla 1.0.1), an even more-expanded Page Info dialogue, MathML being enabled on all platforms at last, and a brand new application icon to replace the blue gecko of old. Most shortcuts to Mozilla itself used the icon shown at right, containing a more textured depiction of the familiar Mozilla lizard head used on other documentation. Other icons with a similar motif were used on or for instances such as the browser window, download manager, or e-mail client. The build number was removed from the title bar of Mozilla 1.1 and subsequent point-version releases; however, the number as well as the "Debug" and "QA" menus prominent in Mozilla 0.9.x continue to be present on newer alpha and beta releases. Mozilla 1.2 introduced the capabilities of finding text as one typed, viewing toolbars as text, as icons, or both; and loading multiple tabs simultaneously as a start page. The "grippies" on the toolbars of Mozilla 1.1 and earlier versions were (temporarily) removed. A subsequent version 1.2.1 release fixed a dynamic HTML bug. Personally, I've always been fond of this version simply because it was the first version of Mozilla I ever tried; the buggy nightmare that was Netscape 6.0 excepted. Mozilla 1.3 introduced some visual changes: The toolbar "grippies" missing from Mozilla 1.2.x were reinstated; the Search button gained some additional 3D shadowing; the entire status bar took on a "pushed-in" appearance, and a resize control was added at lower right. A new splash screen was added to replace the old Netscape fire-breathing lizard. Other new features included automatic image resizing and the ability to switch software profiles when Mozilla was running. 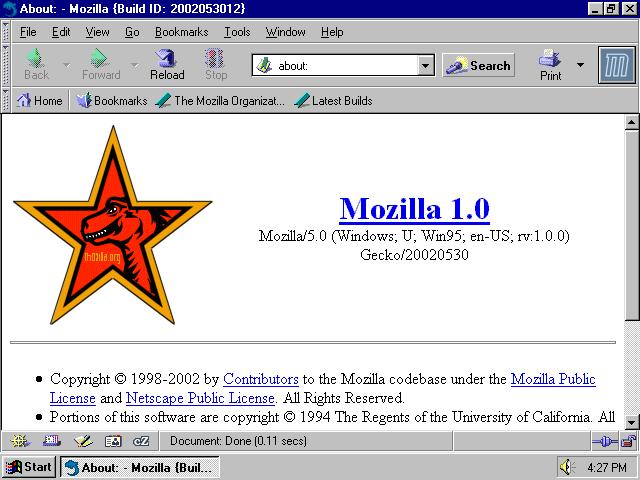 While it looked identical to the previous version, Mozilla 1.4 introduced a large number of changes "under the hood." NTLM authentication was added to enable compatibility with Microsoft proxy servers; pop-up blocking was streamlined, many improvements were made to the e-mail client and Composer, and the bookmarks feature was substantially overhauled. 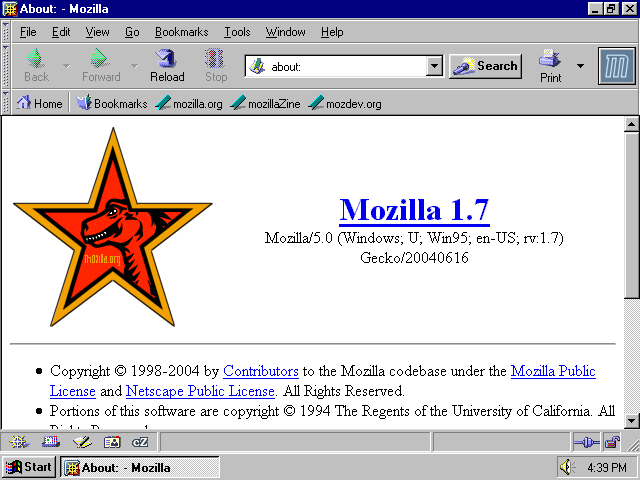 Netscape 7.1 was based upon (and in fact released the same day as) Mozilla 1.4, and contained a number of further changes such as a redesigned proprietary Radio feature. The capability of finding text as you type and a number of assorted mail- and Composer-related improvements manifested themselves in a Netscape release for a first time. 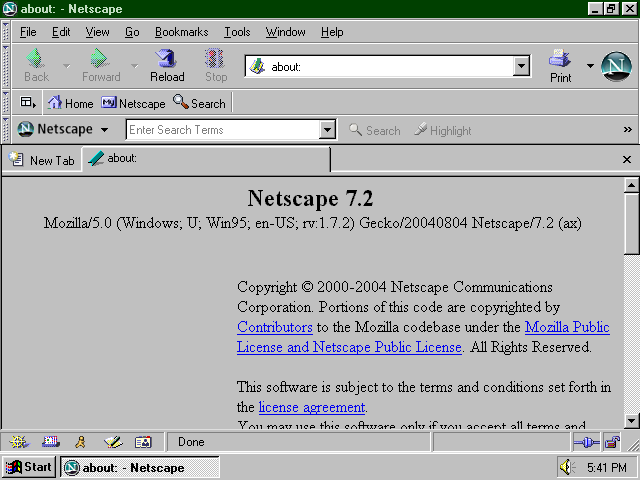 Visually, the Netscape "throbber" began to take on a glassy appearance; a spacer was added between the sidebar toggle button and the remainder of the Personal Toolbar; an AIM button was added; the Radio button's icon was changed, and the task drop list next to the location field was finally removed. This release also holds the honor of being the last Netscape-branded browser released before Netscape essentially ceased to exist in July 2003. Some evidence suggests that it was rushed out a bit faster than usual to facilitate this: There are references to "7.1b1" in a configuration file (suggesting that it was originally intended as a beta or preview release) and it contains a number of bugs that perhaps otherwise would not have been overlooked such as a system-resource depletion issue on Windows 95, 98, and ME. Mozilla 1.5 added a spell checker for the e-mail and newsgroup client and Composer, a confirmation dialogue when closing a window with multiple tabs, line and column references in the View Source window, "::" CSS pseudo-element support and other general rendering technology improvements, and miscellaneous changes to accessories and components such as Chatzilla. MNG image support, however, was removed due to concerns of practicality and space. With the dissolution of the Netscape browser development team in Summer 2003 and the establishment of the Mozilla Foundation at the same time, behind-the-scenes changes in the way the software was developed began to take place, and most intensive development shifted from the established Mozilla suite to the standalone browser then codenamed Firebird. These changes were alluded to in the Book of Mozilla easter egg, which from this version on was turned to chapter and verse 7:15. Most of the changes to Mozilla 1.x from roughly this point on were limited to rendering and minor feature improvements. Mozilla 1.6 introduced a number of subtle improvements, including rendering changes and the reappearance of a "Translate Page" feature. Visually, the spacing between icons and text on the toolbar buttons was increased, and the Navigator application icon seen on the title bar and taskbar in this screenshot now had a white border around the triangle. Finally, Mozilla 1.7 added a confirmation dialogue for setting images as wallpaper, FTP upload support, redesigned cookie dialogues, improved pop-up window blocking, many changes in rendering technology such as support for the CSS opacity feature (although buggy at lower color depths), and improvements in file size. A large number of Mozilla 1.7.x maintenance updates were released, and some subsequent technological improvements in Mozilla Firefox were backported to the suite. Mozilla 1.7.x proved to be the final Mozilla-branded application suite release in the 1.x series, with "official" development concentrating instead on Mozilla Firefox (and Thunderbird) from 2005 on. While the Netscape browser development team was essentially dissolved in July 2003, a final Netscape 7.2 release was nevertheless created one year after the fact; presumably by ex-Netscape developers still working for AOL. Aside from the minor changes also introduced in Mozilla 1.5, 1.6, and 1.7, Netscape 7.2 also sported a simplified Personal Toolbar, a Search button removed by default, and the new Netscape Toolbar; a mostly-redundant tool linking with a search engine and providing an additional front end for the pop-up blocker. As an additional note, fewer third-party software was bundled with this release, and Netscape Search was the only built-in search engine plugin provided by default. When a formal announcement on the future of the Mozilla 1.x suite was made in March 2005, a consequence was that it was then known that there would be no official Mozilla 1.8 software release. Several Mozilla 1.8 alpha and beta releases had been made up to that time, but abruptly halted at the time this announcement was made. An infrastructure, however, was provided for contributors to continue to develop the browser under a different name. 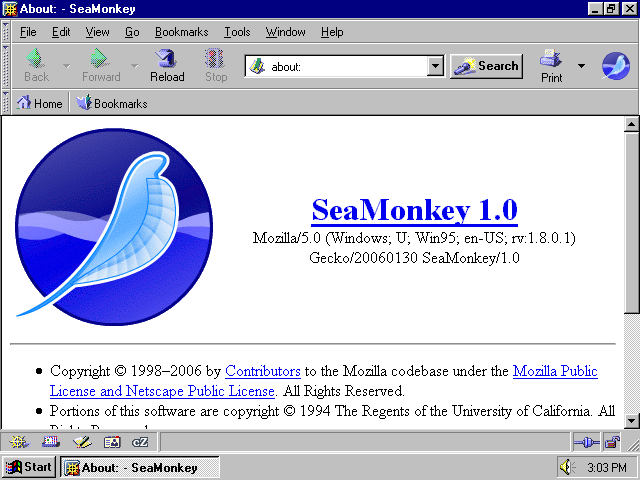 As a result SeaMonkey 1.0 Alpha, a continuation of the Mozilla 1.8 beta line wearing the original codename from the software in question, was released in September 2005. 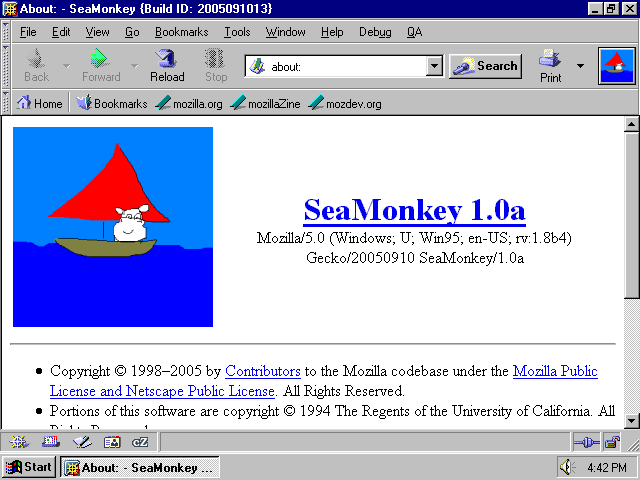 This initial testing release featured a set of crude and rather humorous interim graphics, featuring a spectacled creature in a sailboat on the sea. As a testing-oriented release, SeaMonkey 1.0 Alpha contains a prominent build number and "Debug" and "QA" menus. A professional graphics set and new logo (implementing a picture of a real sea-monkey, an aquatic branchiopod) were created in December 2005 for SeaMonkey's 1.0 Beta release, and a final version was released at the end of January 2006. This software implemented the many changes introduced by the various Mozilla 1.8 alpha and beta releases over the previous two years, as well as many features backported from Mozilla Firefox such as drag-and-drop tab reordering. The former Mozilla suite will continue to be developed in this SeaMonkey-branded form for the forseeable future. Last update April 2, 2008.